In fairness to these puppies, I figured I should do a video of what the puppies do most of the day, well, almost all day. Then I rang the lunch bell, and this peace and quiet went out the door. A good night's sleep, a full belly, and a clean house make for happy and energetic puppies in the morning. There are many reasons these guys are in the garage, and this is one of them. Later today: outside time! 5 week birthday pictures. They get cuter as the weeks go by. Stay tuned tomorrow for their first time outside! I'm on my own until tomorrow, while the rest of the family is away. I'm up to my ears in puppies...and poop! Well, this was a bit of a challenge with 10 puppies. Like human family photos, not everyone cooperates. Some cry, some fall asleep, some turn their backs in refusal of having their picture taken. This was about as good as it was going to get. All puppies have been placed in loving homes. 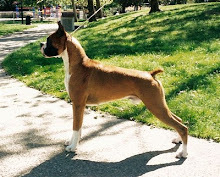 If you are interested in being on our waiting list for Eve's next litter, please contact us at bishopsboxers@gmail.com. One benefit of doing dog chores is puppy time in the box with them. It's worth all the poop in the world. 4 weeks already! It's gone by so quickly. The puppies have probably doubled in size this week, especially with the puppy food boost. They are really interacting with each other, and their personalities are a little more evident. Here are their sweet faces. Pardon their messy mouths--they had just eaten breakfast. We moved the puppies into the large weaning box tonight and gave them their first meal besides mom's milk. They plowed through it! As you can see, it is quite a messy operation. I bet your house isn't as loud as ours in the morning! Don't worry, they sleep quietly through the night. But once they get up and Eve goes outside and gets some breakfast, they cause quite the raucous until she gets back for their breakfast. They will start their puppy food in a couple days. The puppies are now getting big enough to step up on the pig rail (the ledge around the inside perimeter of the whelping box--this is meant to prevent moms from crushing the small pups when they are too little to be able to get out from under her). We'll be transitioning them into the weaning box this week to provide a safe environment while they grow. Here some of them are, peering over the side. Three weeks has gone by quickly here at Bishop's Boxers. This week, the puppies' ears have opened, and their sharp, little teeth are starting to come in. Next week, they will move to their bigger house to allow for more space to play. These guys are more entertaining than TV. They are getting more active with each other and are more vocal now that their ears are open. I think they like hearing themselves. Stay tuned tomorrow for their 3 week pictures! The clan was pretty active tonight, and I was able to catch them for a little bit before they all crashed again from their brief activity. They are pretty comical! You can pause the Boxertunes music at the bottom of the blog so you can hear all of their puppy noises. Ginger, planning the escape route for all when they get a little bigger. Climbing puppy mountain. They love it!